Fidi from PercyPea Ltd. is a simple iPhone game where you are a stream of green triangles whose purpose is to avoid the red circles and collect the blue squares. If you’re feeling fancy, you can attempt looping your triangle stream around the red circles to destroy them (receiving bonus points in the process). All this action takes place on a white grid background that reminds me of graph paper from high school math class. There are borders in the playing field, but the outside of the field only differs slightly in color from the white graph paper background itself, so in the wrong light you don’t see the border coming. All you know is that the triangles have stopped or are trapped in a corner suddenly. The game is set to electronic music that has a high pitched synth sound every few seconds. While catchy at first, I found myself wanting to turn the music off after playing for a little while. Thankfully, the sound can be muted by touching the speaker pic in the upper left hand corner. Perhaps there’s another song if you reach a different level in the game, but I am so bad at it that I haven’t been able to find out yet. Let me tell you why I’m bad at it. It’s not my fault. The way the game is played is counter-intuitive. If you want your triangles to move towards you, you have to tilt your device away from you. If you want to move left, you have to tilt right. When running for my life from scary red circles, how can I be expected to remember that I’ve entered opposite land? By the time I make the wrong move and try to correct myself, those red circles have already ended me. 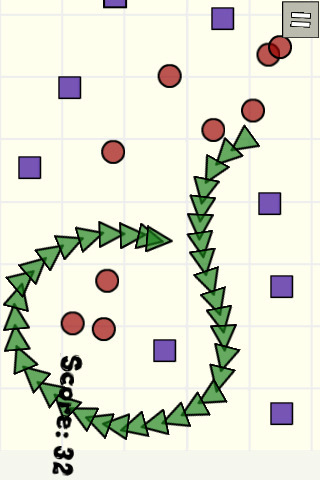 Forget the complicated looping maneuver, I couldn’t get the straight line part down, let alone the rounding up of my red circles like cattle. If I wanted to embarrass myself further, the app gives the extra option using OpenFeint (free) to check out leaderboards, see your achievement level obtained, join the Fidi fan club, and see if your friends are playing. Thru the fan club portion, you can see developer announcements, subscribe to the newsletter, add the game as a favorite, etc. I was surprised by all these options, considering how basic the game itself appears to be. I would like to see the controls reflect actual player movement, and the border changed to a darker color so I can see a wall coming. Perhaps song options or less intense music, too. Oh, and when I catch those pesky blue squares, a louder acknowledgement of my triumph would be nice. In turn, a sound to reflect when a red circle kills me could also be added. Overall, I could see the simplicity of the game translating into an addictive way to pass time. If some changes were made so that it’s easier to play at first, I’d pay the $0.99. AppSafari review of Fidi was written by Tyne Kennedy on March 26th, 2010 and categorized under App Store, Fun, Games, Physics Based. Page viewed 4210 times, 2 so far today. Need help on using these apps? Please read the Help Page. This is obviously an error on my behalf for not making the tutorial clear enough, but you don’t actually tilt the device. You need to rotate the device (with the screen always facing yourself) around 360 degree, so that the green snake is always facing forwards. Good points on the boarder color and audio. Thanks and I hope this helps make the game more enjoyable for you!